Shiner wanted to share some awesome new doggy products she got to "taste test" last week. The new products are from a company called VetIQ - the maker of Minties and some other great pet products. 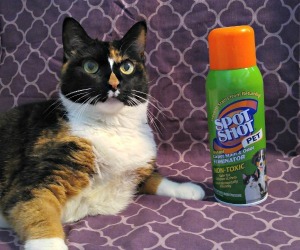 When VetIQ asked if Shiner would like to try out a few of their new products, she jumped at the opportunity. We received a package of Minties to try out. Minties are dental chews for dogs that "helps clean teeth, promote fresh breath, and helps control plaque and tartar. 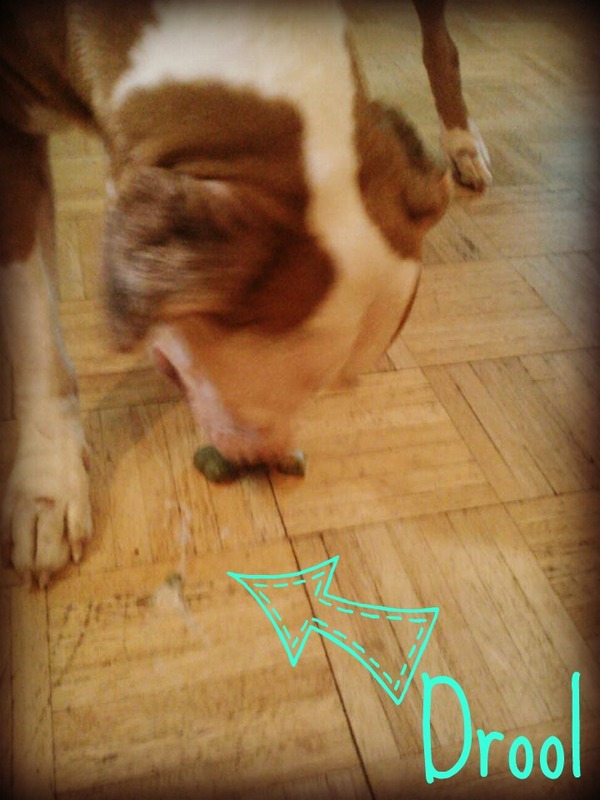 The treats are made with mint, parsley, fennel, dill, and chlorophyl which are all natural breath fresheners. Minties are also wheat free, gluten free, soy free, corn free, have no artificial flavors, and no animal by-products. They are made in the USA. I must say that I've never smelled a dog chew quite like these. They smell great and have a very minty and fresh aroma. Shiner is a "scarfer", so it really didn't last very long. Maybe 5 minutes since she's an aggressive chewer. After she ate her Minties dental chew, I sniffed her breath and it really was minty! I gave her another sniff test about an hour later and it wasn't quite as minty but still smelled pretty good. 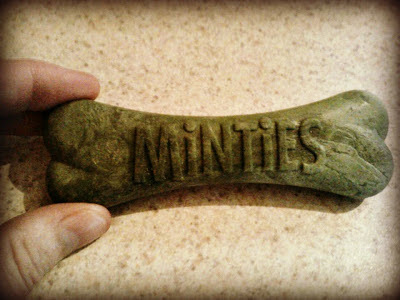 A Minties dog dental chew. Shiner, of course, loved the Minties. I tried to get a picture of her waiting for one, but she actually jumped up and snatched it right out of my hand. I guess she decided self control wasn't important at that moment. There was a bit of drool involved. You can see the drool trail she left on the kitchen floor. 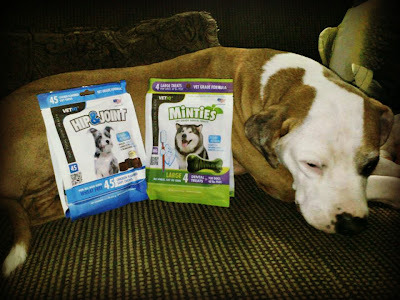 We also received a package of VetIQ Hip & Joint Soft Chews supplement. These soft chews contain Glucosamine HCL, Methysulfonylmethane (MSM), Creatine, and other supplement to help support cartilage and other connective tissue. They are also made in the USA. Shiner's never really taken a supplement for her joints before. Recently, she acquired a small limp in her front carpus (wrist). I haven't seen it recently and attributed it to possible arthritis because after all, she is 10 years old now. Although I haven't had much time to see a real change from taking VetIQ's Hip & Joint Soft Chews, I have noticed Shiner has been a little bit more playful lately. But do the Hip & Joint Soft Chews pass Shiner's taste test? Of course! They are very soft and chewy and taste like chicken. According to Shiner, anyways. Shiner loved them! She has been enjoying getting them daily. VetIQ also offers many other pet products like VetGuard Plus for flea and tick prevention, prescription medications, treats, and supplements. Their products are sold by a number of retailers in the US so they shouldn't be too hard to find. Disclosure: Pawsitively Pets received these VetIQ products free of charge to review and share our honest opinion with our readers. All thoughts are our own. We were not compensated for this review. Great review! Hard to believe Shiner is 10! Sounds great. I agree that Shiner looks great for 10! I want to try these. 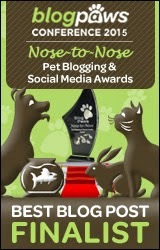 Freedom, Casper & Nikki love Greenies, so I'm sure they would love these too. I'm sure they would. We've never tried greenies before, so we don't have anything to compare them to. Those sound like some great treats!! Hi kitties - I'm afraid they don't make a Hip & Joint for the felines :( Don't worry - Cosequin is a great option! Sounds like it's doing the job anyways. Great review! How funny that Shiner loves those Minties so much that you could barely get a photo. Great job Shiner and a great review too! Your babies are so adorable. And almost ten! Now I'm wondering if I can blend the mint in my herb bed (it's all that's in the herb bed now) into something my dogs will eat. Hmm. I don't see why not, but it's gotta be something they'd like to eat like you mention lol. I guess that's hard sometimes! Aww Shiner got goodies! I've never heard of these but it their yummy, I'll take Shiners word for it! Shiner, you look great for your age! Pawsome!! Shiner looks young for her age :) I hope I look as young when I am 10. 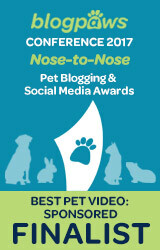 VetIQ was at BlogPaws this year! High Paw! I like the sound of the minties! That was a really good review. I would be interested in the hip and joint treats but I checked the site and couldn't find a price. My dog needs those. I think it depends which store you buy them from. I looked at Walmart.com and they are going for $12.88 over there for a bag of 45. Just bought a bag from Walmart. They aren't soft and chewy as advertised. Yikes! The ones we got were soft and chewy. Maybe a bad batch. Expiration date is 4/6/2015...no typo...2015. I guess it very well could be. I would describe the texture of ours as soft and easy to break in half. I guess they are not chewy like peanut butter or something, but they are easy to chew. Definitely not hard or crunchy. we've been taking these for about 3 months now...if they are hard, take them back to wally world. macie, our retriever is 7 years, old terrible back problems...she seems to be responding to these very well...(plus vet meds).....macie, bodie, and izzie. Bite-size, easy-to-feed, all-natural chews that smell great! 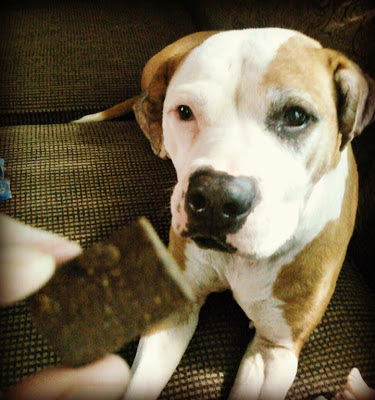 I would give my dogs treat regardless, so why not give a treat with added benefits! The resealable bag is also a plus. I will be picking up the other varieties very soon! I want the packaging to include the warning about not feeding to diabetic dogs in bold print on front of package. My dog had no sign of any kind before being given the hip and joint chews. Now he is very sick and now diabetic. These supplement was only change in diet.